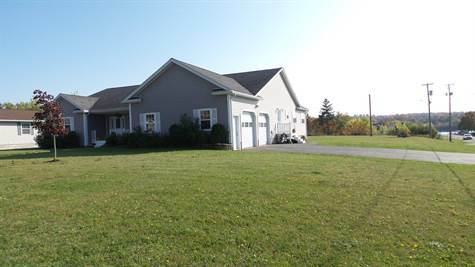 Take a deep breath & let this custom designed 4 bedrm, 2 bath home MOVE you! Step into the spacious mudrm w/attached double car garage. The heart of the home is the kitchen & you are going to want to live in this one! This massive space could easily allow for an island if desired. The open floor plan features a casual eating/breakfast nook & living rm complete with a wood burning stove to add warmth & ambiance to those winter blahs. Step through the patio doors onto the expansive deck so large, all the parties will be at your house! A formal dining rm opens to an oversized family rm & access to the front porch that is begging to be enjoyed during a lightning storm. This laundry rm makes life easier w/appliances included, a folding area & lots of storage. 2 full baths are conveniently located & the master boasts double walk-in closets large enough for a King & his Queen & doors leading you pool side for those midnight dips! The full unfinished basement is plumbed for a 3rd bathrm & large enough to play indoor hockey..true story! You will enjoy the walking trail just a few steps away & the sunsets over the St Croix River are stunning! Book your private showing today! Please Note: Taxes reflect non-primary residency.